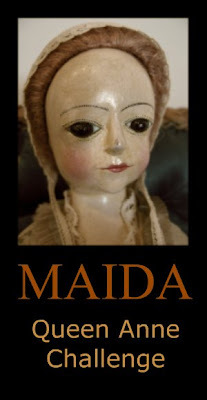 The Maida Dolls Group is going to have has had a challenge where everyone makes a creation that in some way is inspired by Queen Anne Dolls. It's sure to be fun! All the people in the group who finish a doll will have their name put in a drawing to win a prize. :-) If you're interested, head on over to the group for more details. The group is open to anyone interested in creating antique inspired dolls. There are lots of resources posted for making a Queen Anne doll in the Queen Anne Challenge thread. Is this thread still avaiable, about the Queen Ann dolls?